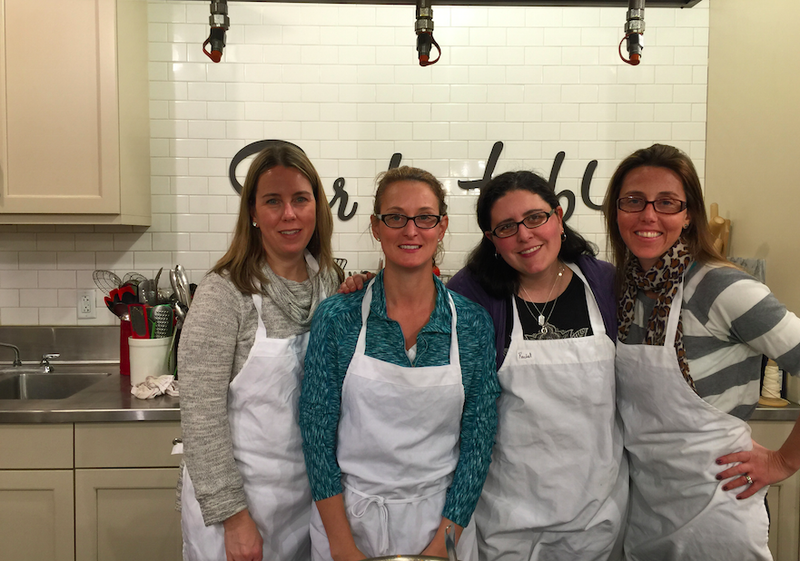 Last Saturday night I took a cooking class at my local Sur La Table. 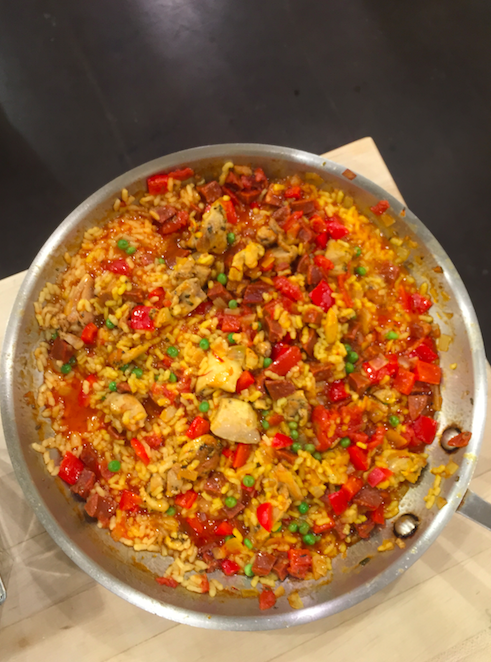 The class was called Flavors of Spain so naturally, we were learning how to make a variety of dishes native to Spain. I almost didn’t make it to the class. I had signed up weeks before and on the day of the class we had decided to head up to the Poconos for a quick day of skiing. We skied all day and then rushed back for a 5 pm basketball game. It was one of those crazy days. My friends were going straight from the game and I was literally still in sweatpants from my quick change out at the lodge and was feeling super pooped out. But at the last minute, I decided what the heck and hopped in the car with them. I happened to have a scarf in the car that I threw on because otherwise I would have really looked like a complete bum. I’m really glad I motivated and went. I actually learned a ton and have a favorite new dish I can make at home! The entire class was close to 2.5 hours and I’d say we were standing and chopping and doing various things for 2 hours – the last half hour we sat down to eat and enjoy the fruits of our labor. By the way, for all you winos like me out there, a good piece of info: Sur La Table is BYO. It’s not widely advertised on the site – our chef & teacher explained it’s because they don’t have a liquor license so they can’t exactly shout BRING BOOZE from the rooftops but it’s fine to come along with a bottle of wine if so desire. I learned I LOVE Spanish Tortilla. 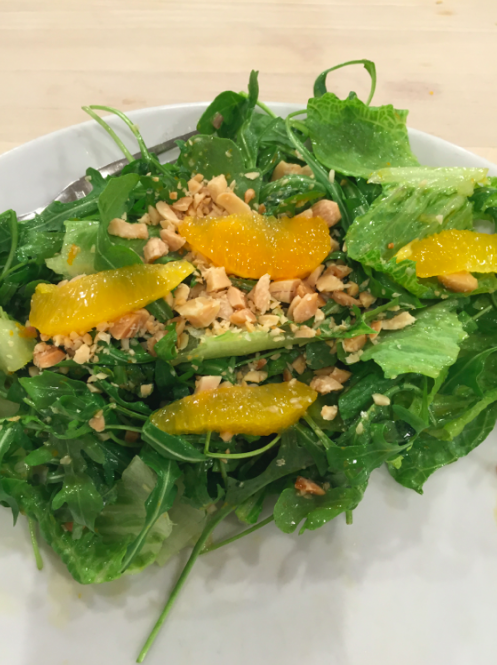 It’s my new favorite dish to make at home – VERY easy to make and so many varieties and possibilities with it. A Spanish Tortilla is not what you think of at all when you hear “tortilla.” It’s basically made up of eggs, potatoes and onion to start and then you add in whatever you want beyond that. They were making it with Shrimp in the class but one of my friends in our group has a shrimp allergy so we made ours without and it was still delicious. 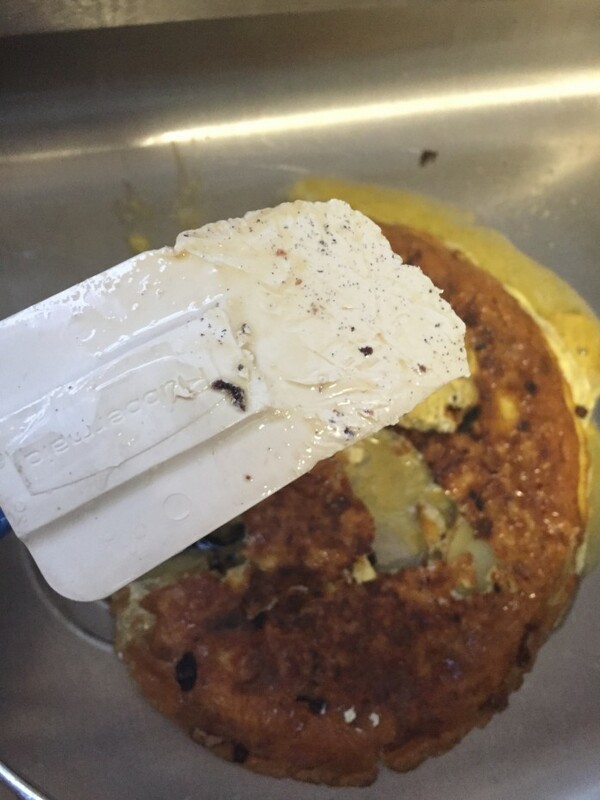 Here is the Tortilla. They also served it with a garlic allioli (garlic mayonnaise) but since I’m allergic to garlic I didn’t try this or the olives. Lastly here I am using the blow torch on the Creme Catalan. It looks a heck of a lot like a Creme Brûlée but it wasn’t really like it at all. The consistency was much thinner once you got below the caramel topping – almost like a pudding. It was still divine though! Swift, right? But all ended well. I tossed the first batch and went with a second that turned out *almost* as good as the one we had made at Sur La Table the night before. 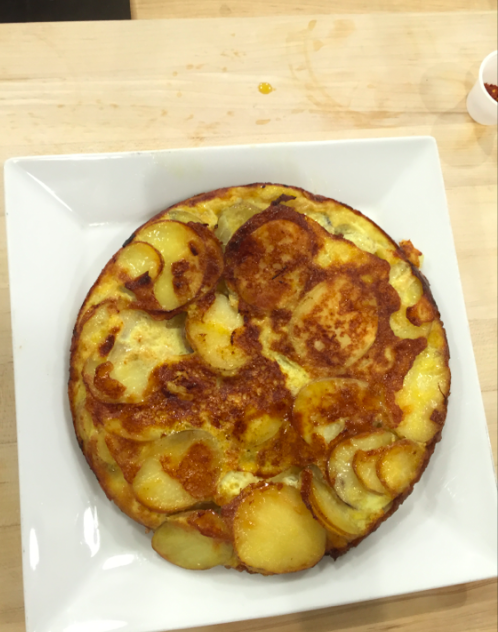 I’ll definitely have to hone my Spanish tortilla-making skills at home some and experiment a bit but overall I already love that taking the class inspired me to get out of my comfort zone and try something new. And I want to try another class again soon. 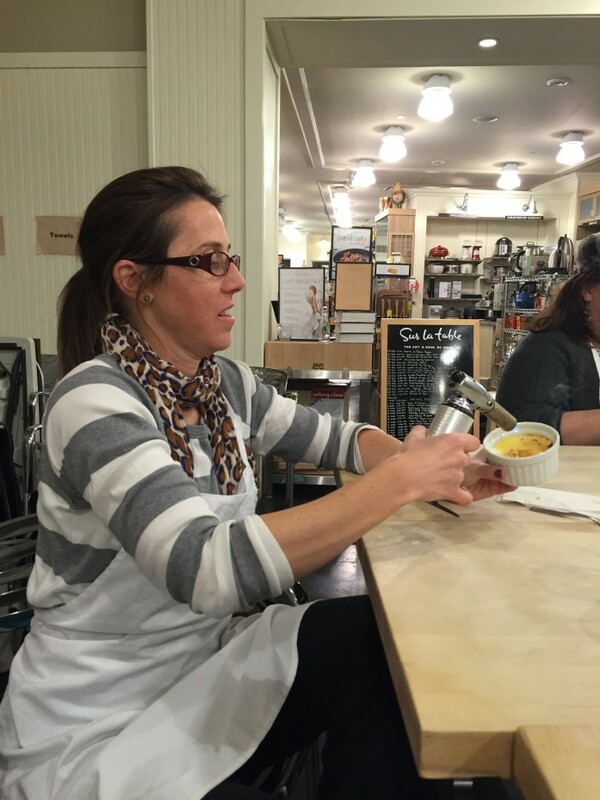 Sur La Table offers a nice diversity of menu and cooking class options so there really is something for everyone. I’d love to try one of the Mediterranean, Vegetarian or Irish Cooking classes soon.